Thick all-rounder. 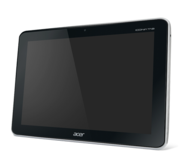 The Acer Iconia Tab A211 offers a multitude of ports and reliable hardware in a robust case. Will this tablet be a success or is it destined to fail? 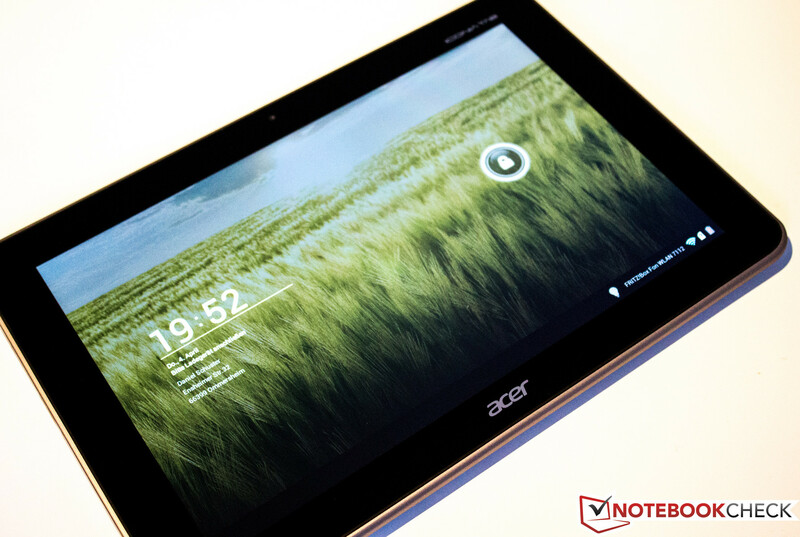 Acer expands its Iconia Tab series with a 3G-ready tablet running on the Nvidia Tegra 3 SoC. The tablet may not be impressive at first glance, but it has a few interesting features to offer, like the full-sized USB 2.0 port. This particular SoC has been around for a while and has made a name for itself in many mobile devices. Thus, it is affordable and reliable. Currently, the Iconia Tab A211 is priced at slightly over 300 Euros (~$386) - quite reasonable considering the 10.1-inch display, 1 GB RAM, diverse ports and 8 GB flash storage. The technical specifications have now been released and in the following review we will share our own experience with this middle-class device. The first impression is lasting. The first time we picked up the tablet, we were surprised. 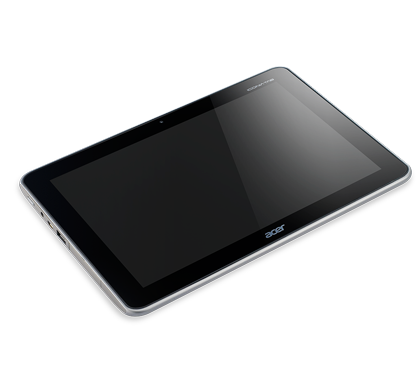 The Acer Iconia Tab A211 is 12.4 mm thick, which affords sufficient space for a full-sized USB 2.0 interface. 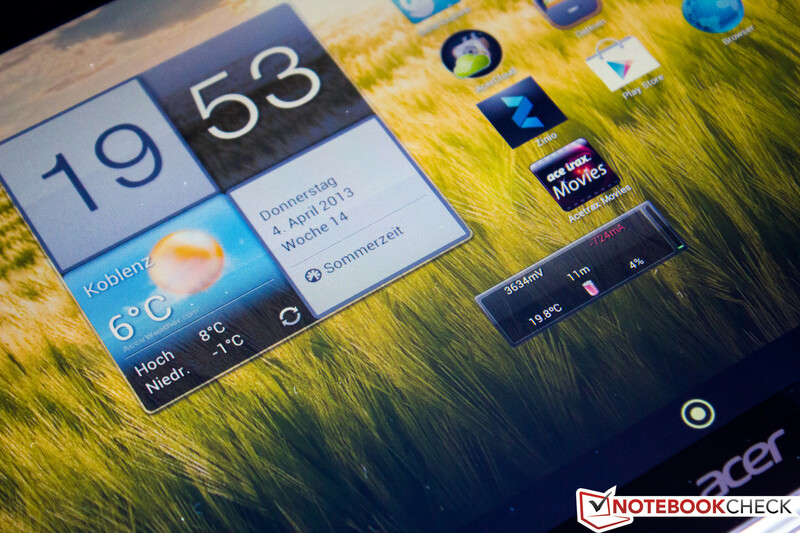 This is a feature only found in a few tablets, like the Samsung Series 7 Slate. At first, we were confused as we could find no identifying inscription on the device. Once we turned it on, the welcome screen confirmed that it was really the A211 Android tablet. The rest of the case measurements are typical for a 10.1-inch display: 260 mm x 175 mm (similar to competitors). The Toshiba AT300SE measures 261 x 180 x 10.5 mm and the Asus VivoTab RT is 263 x 171 x 8.3 mm. The A211 is noticeably heavier than the competition: the 3G tablet weighs 770 grams (AT300SE: 625 g, VivoTab RT: 525 g, Xperia Tablet S: 570 g). The width of the case ensures sturdiness. The material is very reliable and resistant to pressure. The back cover is made of polycarbonate and can be pressed inwards slightly near the middle. 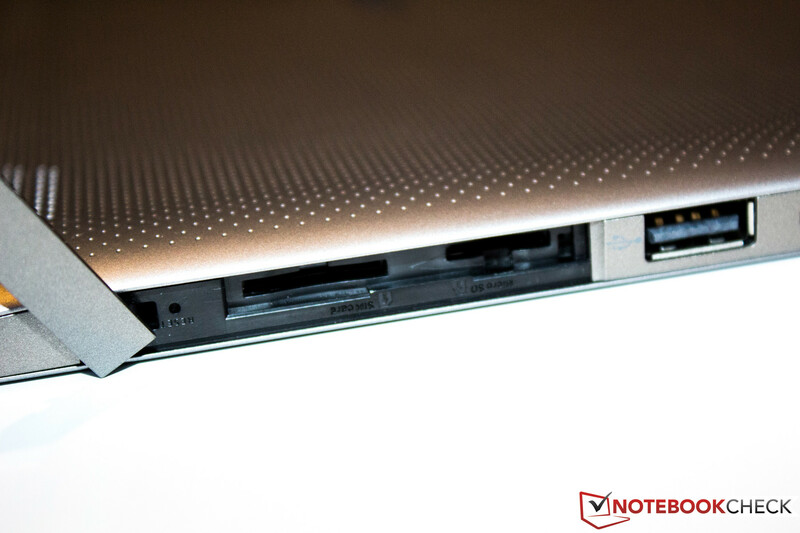 Acer has installed a 1 mm rubber display border between the panel and the back cover. A similar design was used by BlackBerry for the Playbook. Given the weight and measurements, we find the feel of the device to be surprisingly good. Our model uses an internal flash memory of 8 GB. If that does not suffice, the user can add up to 32 GB more using the Micro SD slot. A flap on the left case edge hides the SD slot. Underneath the Micro SD slot, we have the SIM card slot (standard size), which provides mobile internet using the UMTS module. 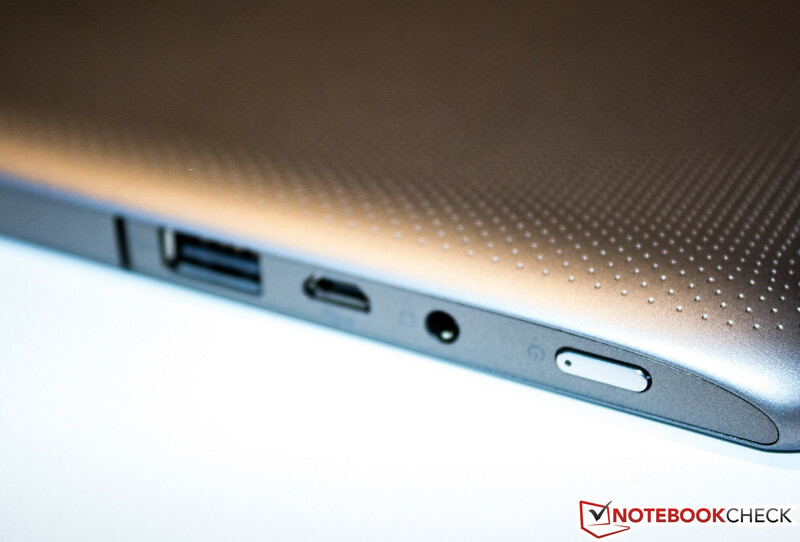 The left edge has many features to offer: a USB port, a Micro-USB port and a 3.5 mm audio jack. This assortment is rounded off by a Power button on the top left edge. This button has a small LED on it which lights up when the tablet is being charged. As the proprietary power outlet is quite similar to the 3.5 mm audio jack, Acer has placed it on the right side to avoid confusion. The top of the A211 features the volume rocker and the rotation lock. Peripheral devices, such as mice, keyboard or an external hard drive, work without issues via the USB port. The hardware was recognized properly and ready-to-use within seconds. The full-sized USB port is a blessing, as the user will no longer have to lug around the cumbersome USB adapters for Micro-USB ports. Top: volume rocker and rotation lock. Left: Micro SD slot, SIM slot, USB 2.0 port, Micro USB port, 3.5 mm audio jack and power button. Navigation on the home screen. Android 4.1.1 runs on our test model. Acer has given the OS its own flair, which is clearly noticeable on the lock screen. The unlocking of the device has been changed slightly and can be individually configured in the system settings. 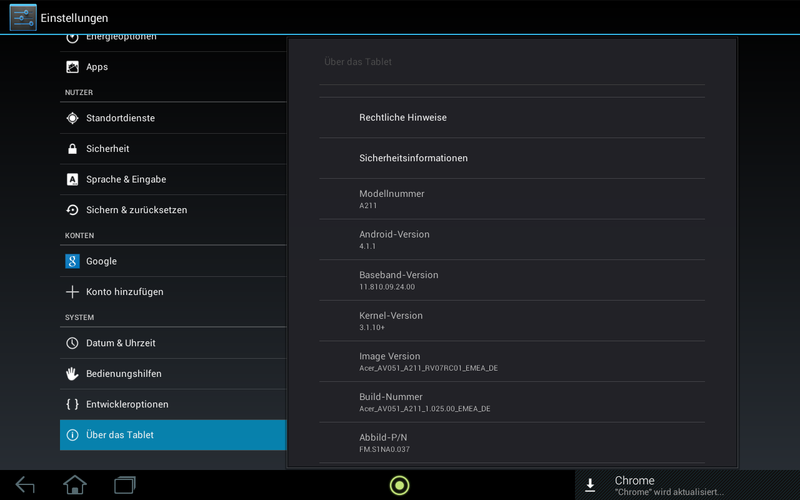 Acer chooses to install bloatware on this tablet, in the form of various apps like Aupeo!, Fantasy Town and Tegra Zone. These cannot be uninstalled, but they can be turned off. The manufacturer has included 3 energy plans in the system settings: High Performance, Balanced and Power Saver. Switching from High Performance to Power Saver will drop the brightness to 25%. Using the CPU Identifier app we were able to document the current clock speeds. A slight difference is noticeable: Power Saver mode runs each core at 1,100 MHz whereas the standard clock speed is 1.2 GHz. The A211 offers two wireless methods for mobile internet. The first is the WLAN module which supports 802.11 b/g/n standards. In our test, the connection was always stable and left no room for complaint. The second method would be to use the UMTS module, which requires a SIM card. The wireless connection can be built using one of the following standards: GPRS, EDGE, UMTS, and HSDPA. Once the SIM card is installed and the correct PIN has been entered, the module will set up a connection (as long as a network is available). This process is automated and we would give it full points, were it not for the problem that we could not turn off the connection without removing the SIM card. Ideally, the user will always be connected to the internet, whether at home or on the go. However, it is not easy to turn off the UMTS module if one is connected to a WLAN network. As both modules will be constantly supplied with power, the battery life will drop significantly. In addition, the tablet does not show which connection is active. The only way to circumvent this issue is to always turn on Flight mode first and then turn on the WLAN. 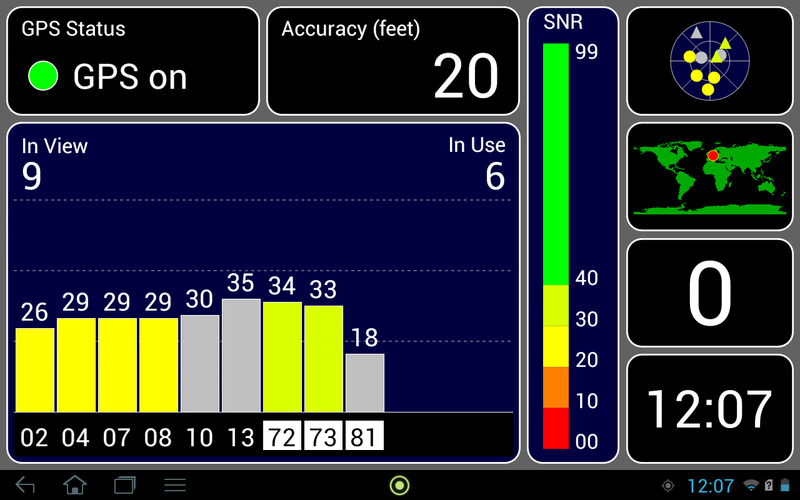 The Sat-Fix of the GPS module works poorly (or not at all) in closed rooms or near windows. Outdoors, the tablet needs around a minute to locate a satellite. The accuracy leaves much to be desired. If one is on the go for long periods of time, the connection improves. 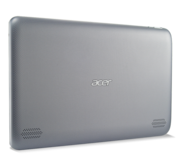 Compared to the competition, the Acer A211 has a poor GPS receiver. 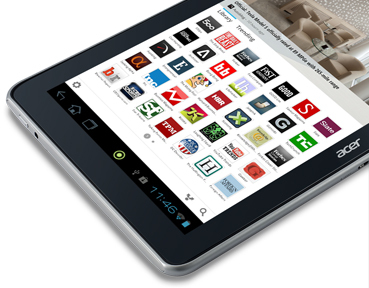 The Acer Iconia Tab A211 uses a single front camera. This is quite rare for a tablet of this price range. We question the purpose of the front camera as most smartphones have better quality cameras. In addition, a smartphone is quicker to get out than a tablet. A better picture sensor would improve the tablet quite a lot as the current webcam has a resolution of 2 MP. The test pictures attest to a low quality front camera. 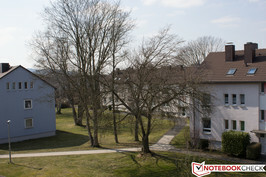 The sensor has problems in weak lighting (picture distortion). In addition, the colors are far from accurate. Despite the low sharpness, the camera can take acceptable pictures in good lighting. The problem is that the front camera mainly serves as a webcam. 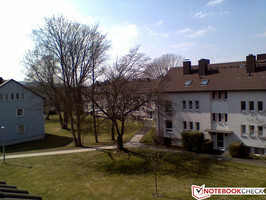 Due to high data usage, the use of the webcam will be limited to when the user is connected to a WLAN network, which is often indoors. This means that the picture quality during the video chat will be heavily dependent on the lighting of the room. 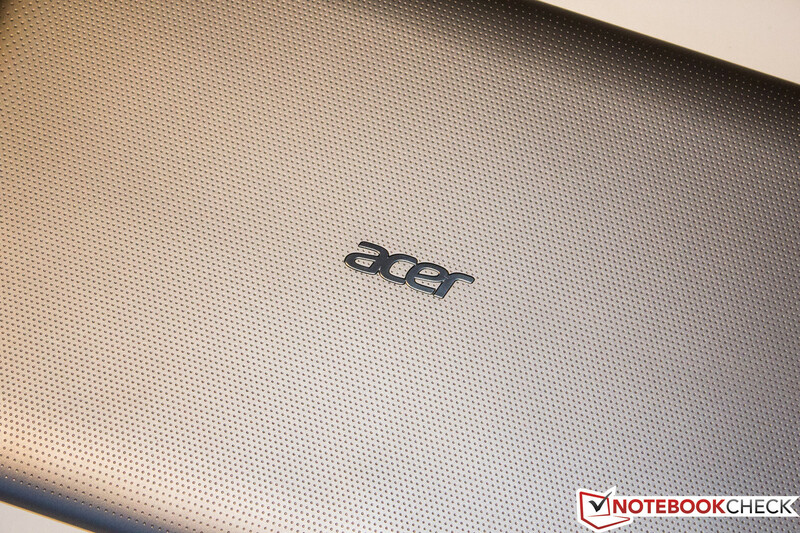 We can understand what Acer tried to accomplish, but it seems as if they were not successful. The accessories of the A211 are quite meager. Aside from the proprietary power adapter, the manufacturer has included a Micro USB cable. A variety of manuals are also included. According to the manufacturer, the A211 has a standard warranty. This describes a 12-month carry-in international travelers warranty. The exact warranty specifics can be found here. The capacitive touchscreen recognizes multi-touch gestures reliably and quickly. The rotation of the display is fast and reliable: as soon as the position sensor is level, the display turns. 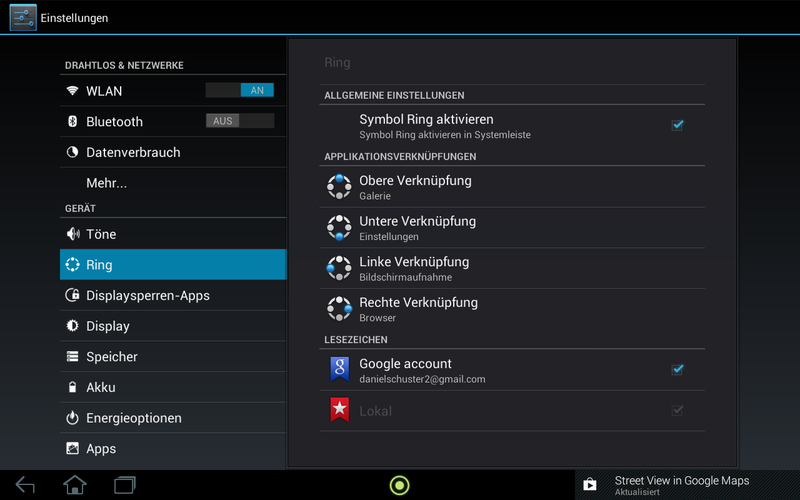 If you do not want this to happen, the rotation lock on top of the tablet is helpful. Aside from the rotation lock, there are three other physical keys: the power button and the volume rocker with two functions. 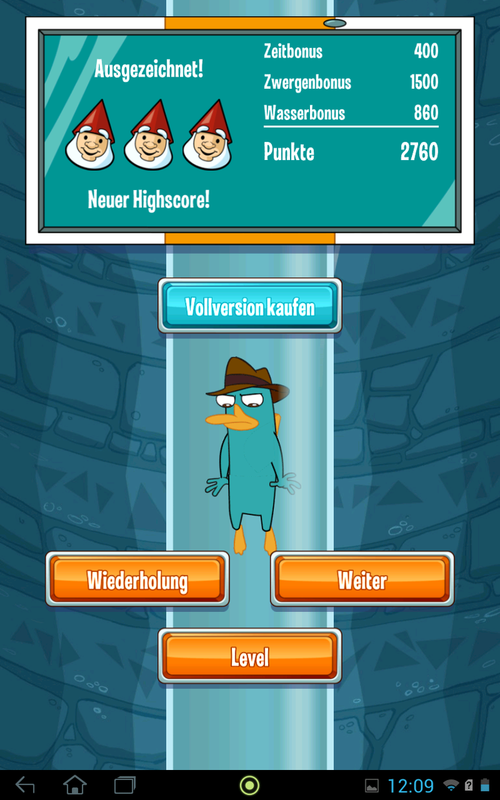 Both keys are placed on upper left case edge (in landscape mode). Working on the tablet is a fluid experience, with the occasional stutter, which often occurs when opening the app drawer. The A211 has a mainstream display size of 10.1-inches. 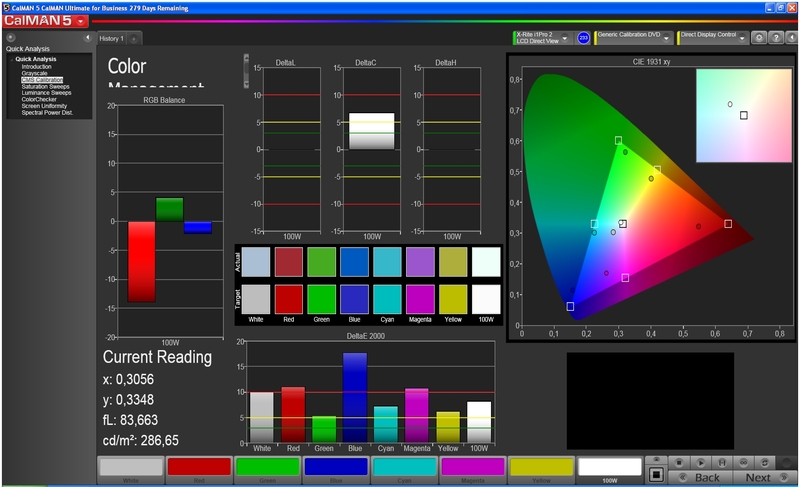 The LCD panel has a 16:10 ratio and a resolution of 1280x800 pixels. This combination results in a pixel density of 149 dpi (Toshiba AT300SE: 149 dpi). With the help of the X-Rite i2Pro 2, we investigated the panel further. 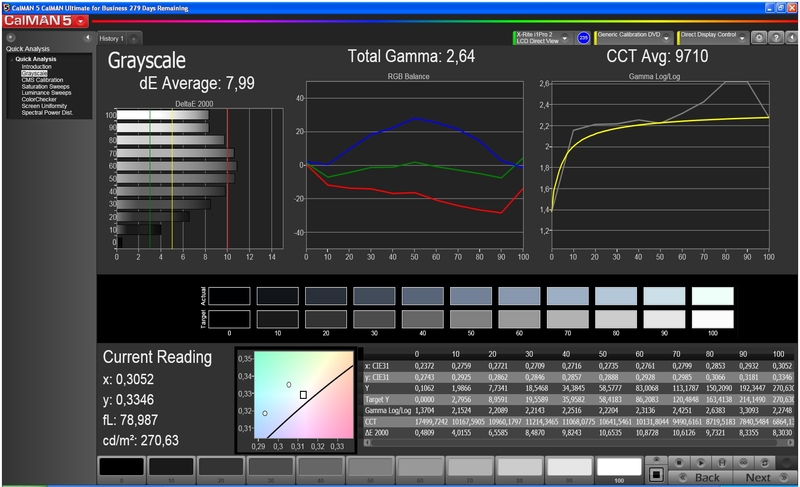 We measured an average illumination of 266.1 cd/m² and a maximum brightness of 290 cd/m² in the middle of the screen. The competition, like the Toshiba AT300SE and the Sony Xperia Tablet S, have higher values: the Toshiba model achieves an average 446.8 cd/m² and the Sony offers 367 cd/m². The illumination of 83% is unsatisfactory. The difference in brightness from the middle of the display to the outer right side is very high. Thankfully, the black value of 0.29 cd/m² and contrast of 1.000:1 are good. 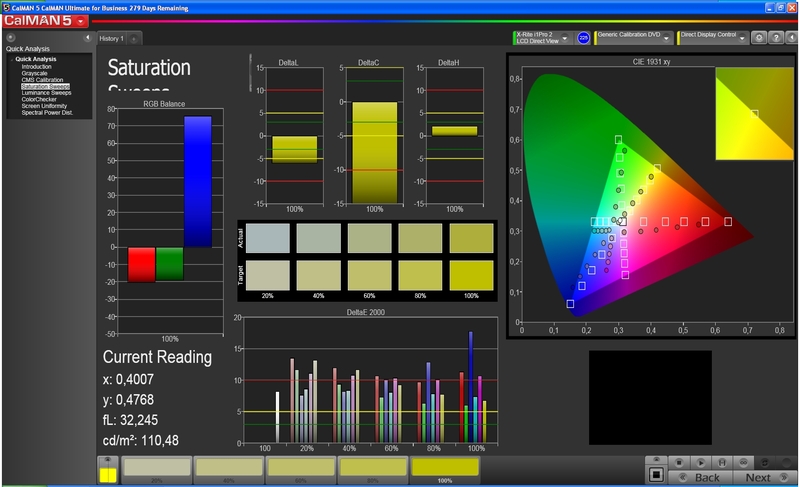 With a color meter and CalMAN software, we evaluated the color accuracy and saturation of the display. From the RGB balance, we see the emphasis on the gray tones. However, it is quite weak. We also notice the burst of the color blue. It exceeds the DeltaE mark of 15. White, red and magenta also exceed the DeltaE value of 10 – this indicates poor color accuracy. Gray values deviate more in brighter colors than darker. The modest display brightness prevents the user from reading the display with ease outdoors. In addition, the reflective display glass throws up distracting reflections. The contrast of 1,000:1 is quite good, but it cannot ensure good legibility. The user will have to constantly adjust the viewing angle to read the display. The legibility is also hindered by the lack of a brightness sensor which means that the user has to call up the brightness settings manually. The viewing angle stability of the panel is very good. The brightness and the contrast drop only at extreme viewing angles. 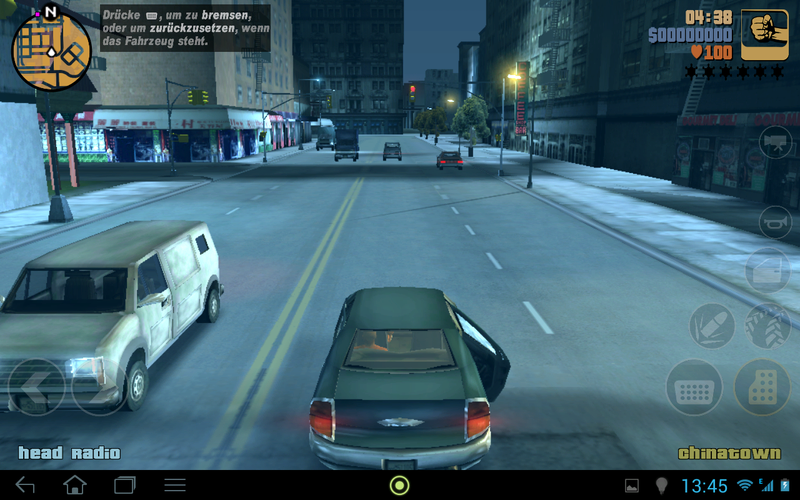 Like in the AT300SE or the Xperia Tablet S, the well-known Nvidia Tegra 3 CPU runs our test model. The SoC is finished in the 40 nm format and employs the 4 + 1 technology. This means that the SoC has 5 CPUs. The 1,024 MB of RAM serves as fast storage. The A211 is meagerly equipped in terms of capacity: 8 GB. The user can expand the storage using the Micro SD slot but this is inconvenient. Our database is now filled with many test models which use the Nvidia Tegra 3 SoC. However, rarely do these test models achieve the same scores in benchmarks (despite the similar hardware). It all depends on the operating system and the apps installed. We ran a variety of benchmarks on our test model to see how it performs. The result is disappointing. Despite similar hardware, the A211 almost always comes up last. The only exception is the Linpack Multi-Thread test, in which the test model can push ahead of the AT300SE and the Xperia Tablet S. The Galaxy Note 10.1 is up to 49% stronger in all benchmarks (except GLBenchmark 2.5). In the browser-based benchmarks, we will also consider the test results of the Asus VivoTab RT, which runs on Windows 8 RT. The result is patchy: in Mozilla Kraken, the two devices are very close. However, in Browsermark 2.0, the gap between the two Tegra 3 tablets increases and the Windows tablet lies at a similar level as our test model. The last benchmark series was unkind to our test model. The Galaxy Note 10.1 achieves a 338% better result while writing 4 KB blocks. The tiny 8 GB flash storage poses a major disadvantage. If the results of the Xperia Tablet S (while writing 4 KB blocks) are blended out, the A211 would take last place. 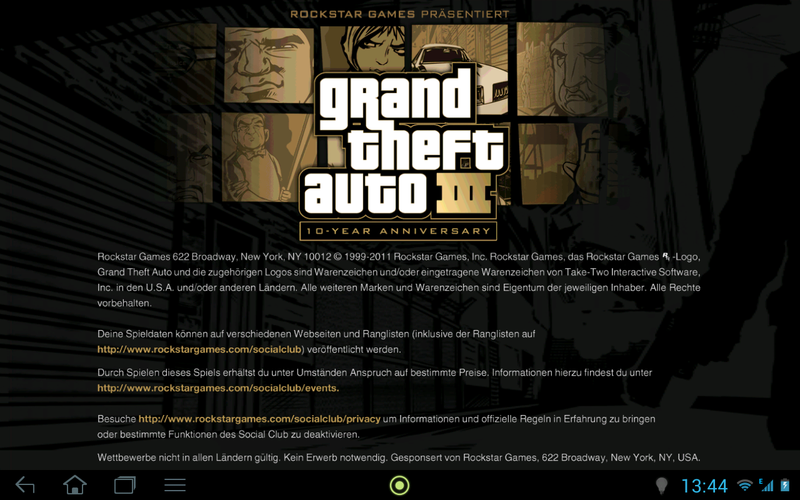 GTA III runs without issues and stutters. Even if the A211 fell behind in the previous tests, here it manages to play multimedia content well. Using various games, like GTA III or Need for Speed: Hot Pursuit, we tested the limits of the A211 and could not find any reason for complaint. The hardware works flawlessly and as is expected of a modern multimedia internet device, the test model can play videos in high quality. We tested this by using multiple trailers in the Matroska format. The data rates of various film sections were above 6,000 kbit/s. The pre-installed player worked well with the Full HD files and provided a fluid picture in good quality. The A211 performs similarly to the Xperia Tablet S. On average and at load, the emissions lie between 32.3 °C (top) and 33.2 °C (back). If the cores are not at full load, the temperatures drop by 2 - 3 °C. Although the VivoTab RT and the AT300SE have a slimmer case, they still manage to have lower temperature emissions than our test model. At any point in time, the A211 is slightly warm. (±) The average temperature for the upper side under maximal load is 32.3 °C / 90 F, compared to the average of 30.7 °C / 87 F for the devices in the class Tablet. The two speakers can be found on the back of the A211. 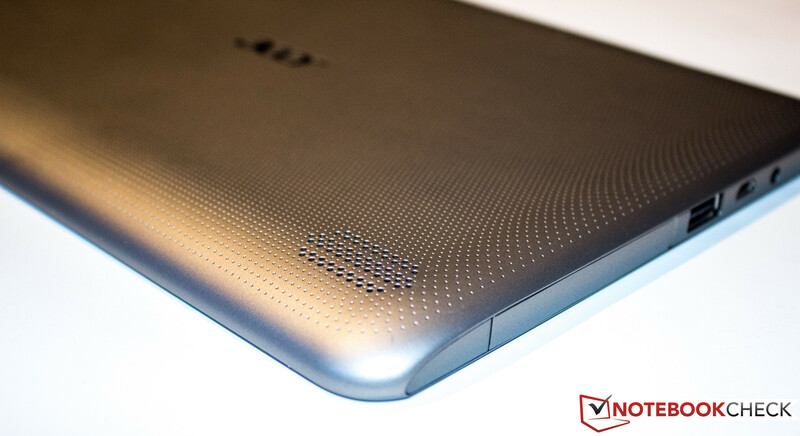 When the tablet is placed on a smooth surface, the speakers are not entirely covered. While playing music, volume levels below 20% are not audible, as the maximum volume is not very high. This is more comfortable for the ears as the sound is not uncomfortably distorted at high levels like in other tablets we have tested. At maximum volume, while playing music which covers a wide spectrum of highs and lows, one notices that the speakers falter. The sound output is slightly distorted. The tablet consumes unusual amounts of power while idle. At low load and brightness, the tablet requires 3.9 W. This is reflected in the battery life of the device. While the Xperia Tablet S achieves between 1.3 and 4.9 W, the A211 requires up to 6.3 W while idle. If the SoC is at high load, the power consumption can jump up to 8.6 W.
The Stability Test app allows us to simulate load on the CPU and GPU. At full brightness and with wireless modules on, the 3,260 mAh battery can last 3 hours and 45 minutes. 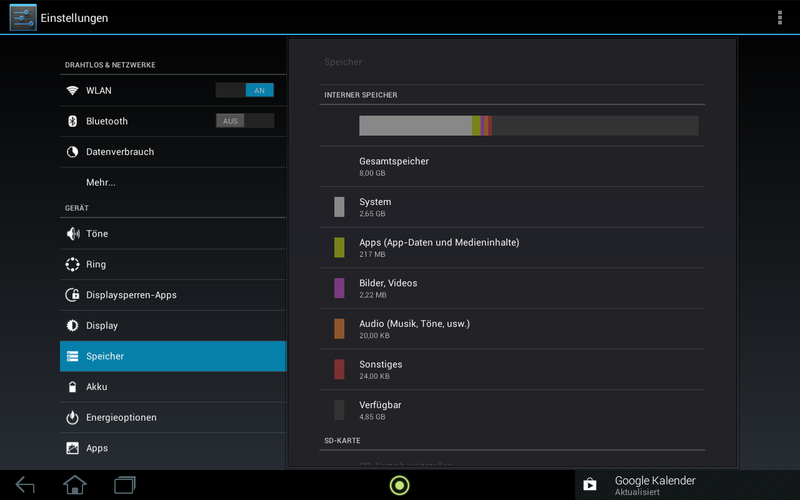 Still 33 minutes more than the Xperia Tablet S, which is probably due to the tablet having a 2 Wh weaker battery. The opposite scenario depletes the battery in 14 hours and 15 minutes. The brightness is set to minimum and all wireless modules are turned off. The WLAN surf test is a more practical test which continuously loads websites and the brightness is set to 150 cd/m². The tablet lasts 6 hours and 50 minutes. Finally, it takes 2 hours and 47 minutes to fully charge the battery. 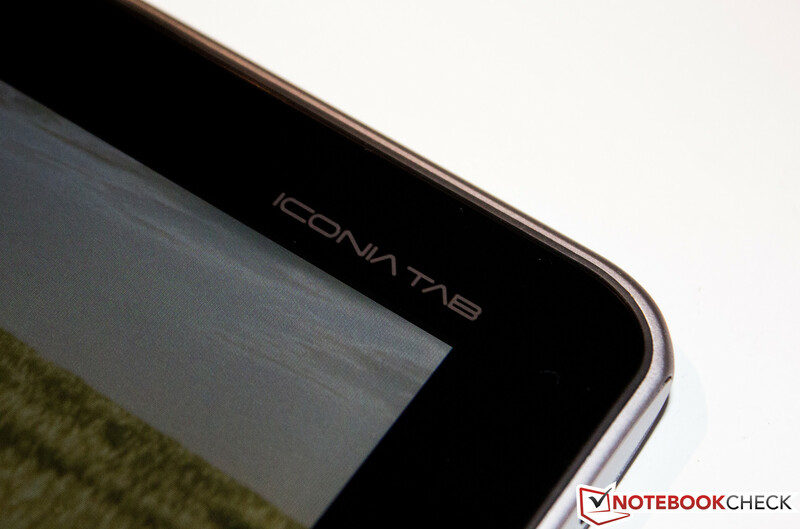 The somewhat chunky Iconia Tab A211 has its pros. 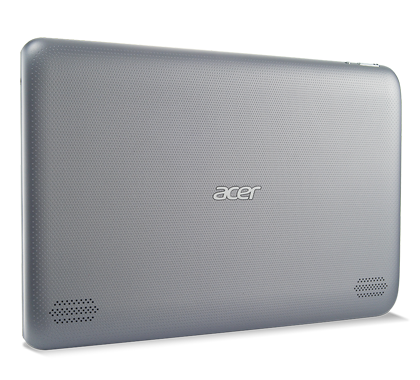 The Acer A211 is an interesting product. For the price of 300 Euros (~$386), the buyer should not expect a miracle, but if you are interesting in having multiple ports on your tablet, then you will be very happy with this product. Sadly, the user will have to make a few compromises: the GPS receiver is laggy and the power consumption can be too high. The screen is not great either: it is not very bright but it does have a good black value and contrast. The hardware is slightly slower than that of other Nvidia Tegra 3 models. Still, the performance is sufficient for all tasks. The A211 belongs to the middle-class segment and is meant for those users who wish for good functionality and a variety of ports. Although it requires the user to make a few compromises, the tablet is not as pricy as many high-end tablets. ... but it has a lot to offer. For example, it includes a full-sized USB port. The UMTS module allows the user to surf on the go. 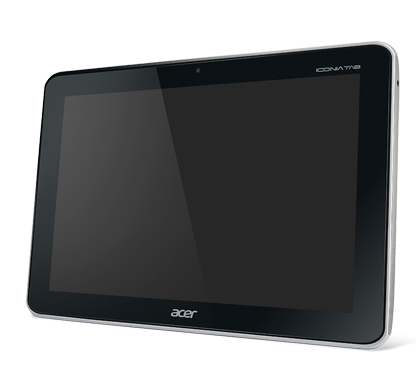 ... thanks to the Acer software, the user can customize the tablet here and there. ... for fine tuning the tablet. ... a few MBs of that is reserved for Android 4.1.1. ... fast enough for the latest 2D and 3D games. ... to save on energy. 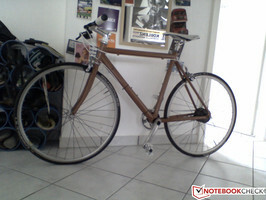 ... sturdy thanks to its thickness. It lies well in the hand. ... as there is no main camera on the back. ... with the exception of the GPS, which is very slow. ... but it has glaring flaws which could have been avoided. 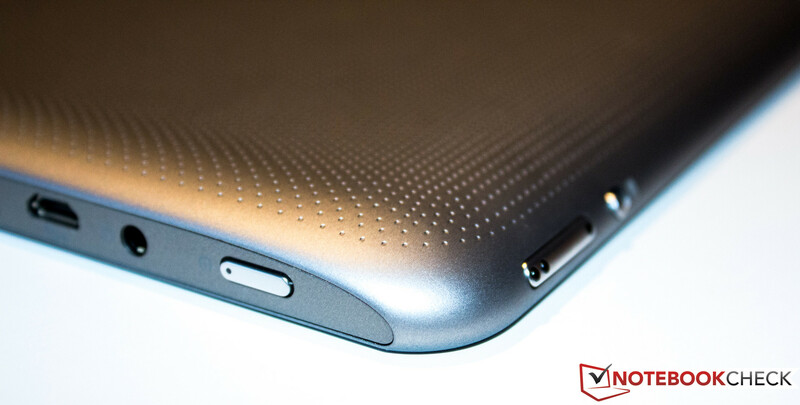 Despite above-average case thickness, the tablet is comfortable to handle and feels very sturdy. The flash storage of 8 GB is quite sparse, even though it can be extended with a Micro SD card. The power consumption is also too high. 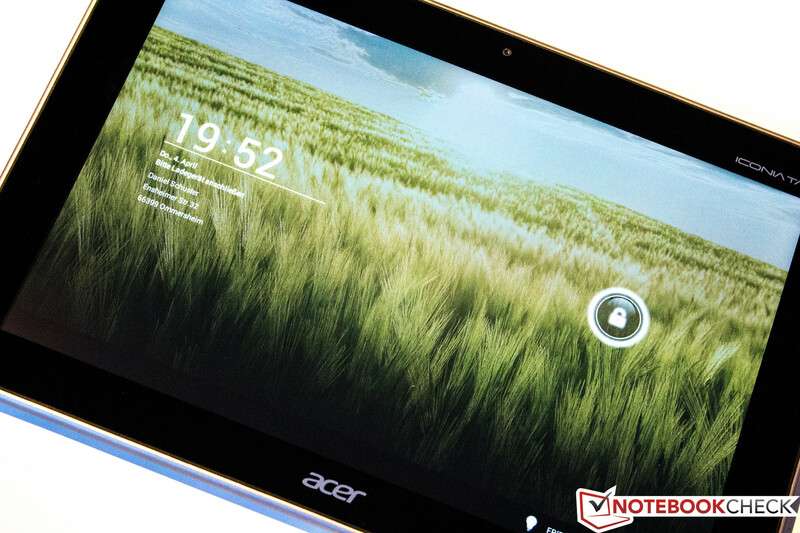 Acer manages to put in a multitude of ports in the 10.1-inch tablet. The full-sized USB port is especially useful. 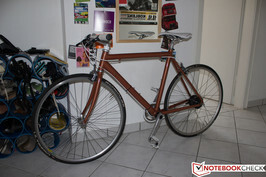 All features are available for a reasonable 300 Euros (~$386).